You likely get recommendations on whom you choose to service your car and which doctor to see - elements of due diligence in your personal life. You should use a similar approach to vendor due diligence. 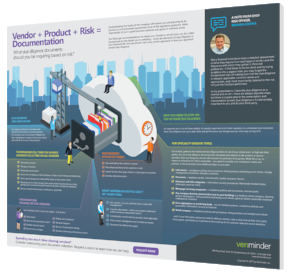 The type and level of risk should dictate the intensity of your vendor due diligence and, therefore, the type of documentation you need to review. "What documents do I need?" is a top 3 question in the conversations we have with vendor managers daily. So, what due diligence documents should you be requiring based on risk? We'll tell you.